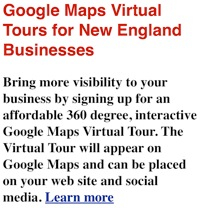 happening, we have a wide variety of New England event listings to help with your your trip planning. Depending on the time of year, we include fairs, festivals, carnivals, town common community events and dinners, museum exhibits, school vacation events, local concerts and art exhibits, sleigh rides, hay rides, sporting and recreational events and everything else "New England." If you have a family-friendly, calendar of events press release you'd like published on VisitingNewEngland.com, please email us and we'll consider it for publication. Please check back often for New England calendar updates, which are updated on a weekly basis!